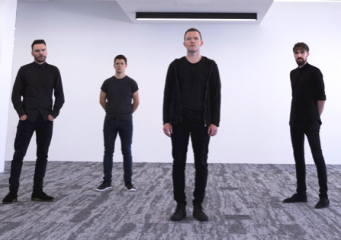 Manchester four-piece The Slow Readers Club have announced a date in Brighton, as part of an extensive UK tour for 2019. The Slow Readers Club evolved from earlier band Omerta, who formed in 2003 and signed to fashionable Manchester label Northern Ambition in 2005. They released three singles, each of which sold out on the day of release and became collector's editions. Their double A-side debut Everything Is Frozen / Learn To Love The System was followed by One More Chance and their final single One More Minute. Despite strong career prospects with support from Steve Lamacq and others, the band dispersed around 2007 with no apparent prospect of further collaboration. Despite the disbanding of Omerta front man Aaron Starkie regrouped his band-mates and together they formed The Slow Readers Club. The band released their self-titled debut album towards the end of 2011, featuring various former Omerta songs, but also three new singles Feet On Fire, Sirens and Block Out The Sun. The band underwent a number of line up changes before settling on the current four-piece line-up of Aaron Starkie on vocals, Kurtis Starkie on guitar and backing vocals, Jim Ryan on bass and David Whitworth on drums, at which point their career progressed. The Slow Readers Club are touring in support of their new album Build A Tower, which was released in May this year and went straight into the Official UK album chart Top 20. "This is the first opportunity we've had to do a full on UK tour, up until this point we've all had day jobs to work around, but 2019 is the year we go at it properly, no more messing about. "We've had tons of people ask us to play all over the UK so here we go." The Slow Readers Club play The Haunt, Brighton, on Tuesday 9th April 2019. Visit theslowreadersclub.com for tickets.